Facebook vs Youtube: Which Side of the Video Battle Are You on ? Originally published on the Moz Blog in April 2016. The rise and rise of online video content over recent years is showing no signs of slowing. According to Cisco Forecast, video will represent 69% of all consumer-based Internet traffic by 2017; this is expected to rise to 80% by 2019. Meanwhile, another study from Business Insider estimates that video advertising will account for 41% of total desktop display-related spending in 2020 in the US. Looking at these stats, it’s clear that video will continue to be a critical element of successful digital marketing strategies for the foreseeable future. As YouTube and Facebook jostle to be top dog in online video, our team of digital marketing scientists at Wolfgang Digital naturally wanted to run an experiment to determine which platform delivers the best value when promoting video content and, importantly, how much quality watched time you get for your investment on each advertising platform. Let’s analyze the numbers and try to settle the “Facebook vs YouTube” video battle once and for all! Here’s how the battle for video has been shaping up over recent years. New online video platforms such as Vine, Instagram, and Snapchat have emerged in the last two years. Meanwhile, others — like Facebook Video — have grown considerably. In April 2015, Facebook got 4 billion daily views. In the space of just 6 months this figure doubled, reaching 8 billion daily views. Critics pointed out that the arbitrary metric of "a view" didn't really mean much, since YouTube counts a view after 30 seconds and Facebook counts a view after only 3 seconds. In January 2016, Facebook announced that people watch around 100 million hours of video a day. In February 2016, Google CEO, Sundar Pichai, reminded investors that YouTube's audience watches hundreds of millions of hours of video every day. Since 2012, YouTube has measured its performance in terms of "hours watched," not video views. As of 2016, Facebook now also refers to the "hours watched" metric. 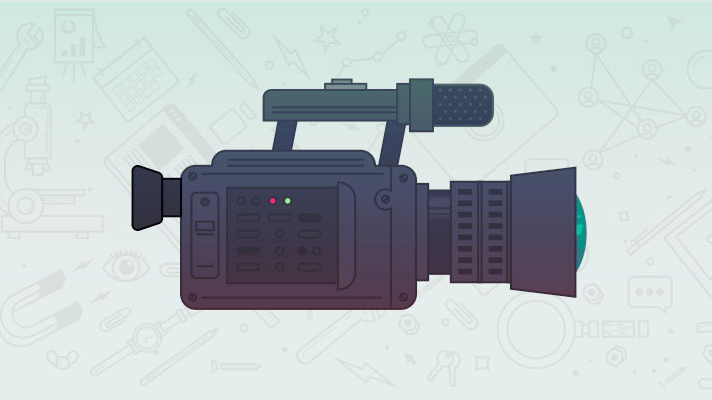 So, where can you get the best value for your video advertising budget? Our experiment ran the numbers — including impressions, overall time watched, and quality time watched — to find out. For this experiment, we advertised the same 20-second-long video over the same period of time and with identical budgets via YouTube ads and Facebook Video ads. 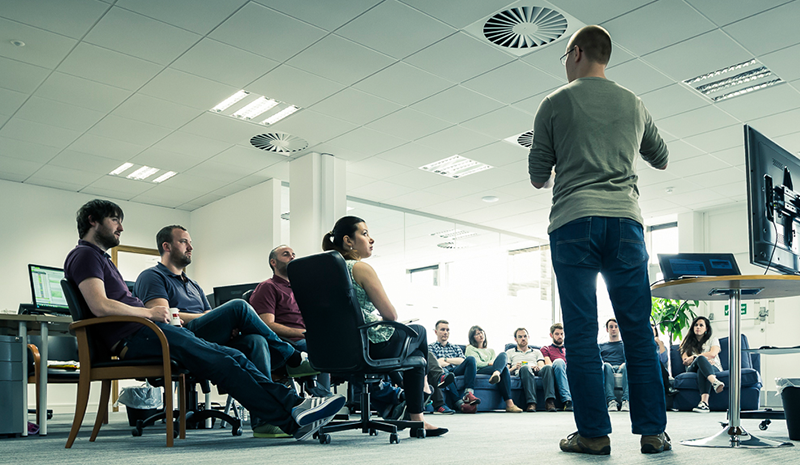 We also targeted the same type of individuals using demographics and interest-based targeting. The first hurdle to overcome was that each platform has different methods for counting views and charging for advertising. In YouTube advertising, you're charged per view. A YouTube "view" is counted after 30 seconds (or the full duration of the video, if it's shorter than 30 seconds) or when a user engages with your video. Facebook, on the other hand, charges by cost per 1,000 impressions (CPM) and a "view" is counted after just 3 seconds. Facebook also displays the Cost Per View by dividing the total spend of the campaign by the views. Taking this information into account for our experiment, a YouTube video view will be counted when it reaches the full duration of our video (20 seconds) and a Facebook view will be counted after 3 seconds. Despite the fact that both YouTube and Facebook have begun referring to "hours watched" as a statement of their performance, this metric is not easily accessible to advertisers. At the time of posting, neither the AdWords nor the Facebook interface give you a number for the exact amount of time watched. In the AdWords interface, you can find the “quartile report,” which shows you the percentage of your audience that viewed certain percentage runtimes of your video (25%, 50%, 75%, and 100%). For instance, in the table below, 91% of total viewers watched up to 25% of the video. In Facebook, you can find a similar report, but instead of showing you percentages it shows you the number of views per percentile. So according to the table below, there were 2,240 views of up to 25% of the video. What this meant for our experiment was that in order to estimate the overall watched time on each channel, we had to use different techniques based on this table and utilize YouTube Analytics. It's difficult to estimate total time watched using the AdWords interface, but we've discovered a 5-minute method that doesn't require any complex math work. See the steps outlined below. 1. First of all, forget about the AdWords interface and go to YouTube Analytics. 2. 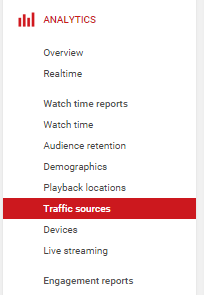 Click "Traffic sources," then select the video you want to measure, the timeline you used when you promoted it, and finally, filter your data by traffic source by selecting "YouTube Advertising." 3. Once you have done that — voilà! You now have overall watched time without having to break out the calculator. *Please bear in mind that there can be a slight variation between the data in YouTube Analytics and the data in the AdWords interface. It’s a little bit trickier to measure overall watched time on Facebook, as there's no advanced measurement system in place like in YouTube Analytics. 1. Get the difference between the views in each percentile (to avoid double-counting). A viewer that has watched 100% of the video has watched 75%, as well. 2. Multiply that difference in views by the watched time in that percentile. 3. Also, don’t forget to count the views (more than 3 seconds) that haven’t reached the 25% mark of the video. The problem with this technique is that you could over- or under-count the time watched, since each percentile varies by almost 5 seconds. For this reason, we are taking the midpoint of each percentile to estimate the overall watched time. As we previously mentioned, we compared the results between both channels by focusing on the following metrics: impressions, overall watched time, and quality time watched. When we compared the same promoted video on both platforms, we noticed that the number of impressions on Facebook was 334% higher than on YouTube. This is because the cost per 1,000 impressions (CPM) is considerably cheaper on Facebook. 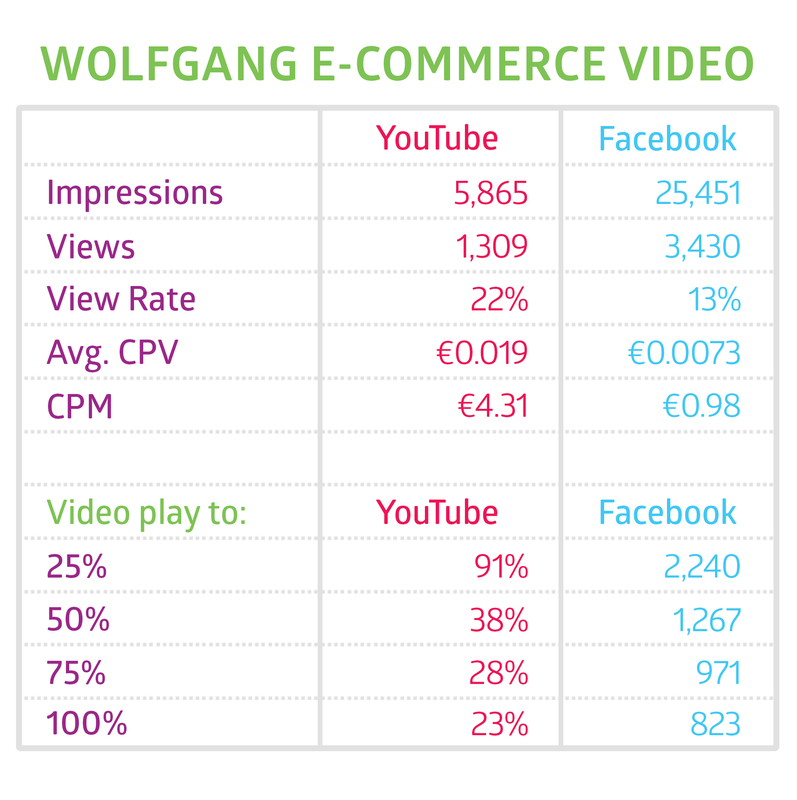 YouTube CPM stands at €4.31 whereas Facebook CPM is €0.98. 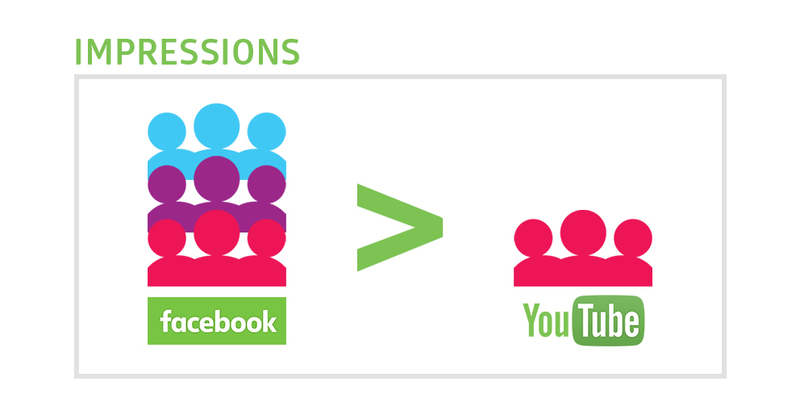 When promoting a video on Facebook, you could get 3 times more impressions for your budget. However, since autoplay could be activated on users’ devices, every impression could potentially count as at least 1 or 2 seconds for Facebook’s overall watched time count. If Facebook counts those autoplay seconds from the impression as a part of their overall watched time, then that could explain why Facebook Video is growing so quickly. By charging a more competitive CPM, Facebook is maximizing its overall reach. As a result, the watched time increases, too. Facebook CPM is significantly cheaper. You can get 3x more impressions for your budget with Facebook. Therefore, if you want to put your video in front of as many eyeballs as possible Facebook may be your best video advertising option. So, how did the two platforms fare in terms of overall watched time? Since neither the Facebook nor the AdWords interface displays an exact time metric, we’ve taken the midpoint of each percentile to estimate the overall watched time. For example, for our 20-second video, a view in the 25% percentile could include anywhere between the range of 5 to 9.9 seconds. Since there's no way to determine the exact time, the midpoint in this percentile would be 7.45 seconds. We have also taken autoplay into account for both channels. Our results showed that overall watched time was higher on Facebook (19.9 hours, including autoplay time) than on YouTube (17.7 hours). We know that YouTube Analytics only shows the watched time from the number of legitimate views for your videos (more than 30 seconds or the full completion of your video if it’s shorter than 30 seconds). In this case, legitimate views would represent around 7 watched hours from the total 17.7 hours. Does the overall watched time affect the cost? No. In fact, this metric gives you visibility on all the additional watched time you are getting for "free." Since we're only paying for full views on YouTube (7hrs), we could see that there were about 10 hours of watched video coming from non-complete views that we didn’t have to pay for. The big question is: How is Facebook counting the overall watched time? If it’s considering more than "views" in its calculation, that could represent almost 20 hours of watched time. On the other hand, if it's taking only views (more than 3 seconds) into account, that could cut the watched time in half to 9.6 hours! So for Facebook, if you're reporting on cost per view, any time watched below 3 seconds is essentially free of charge. 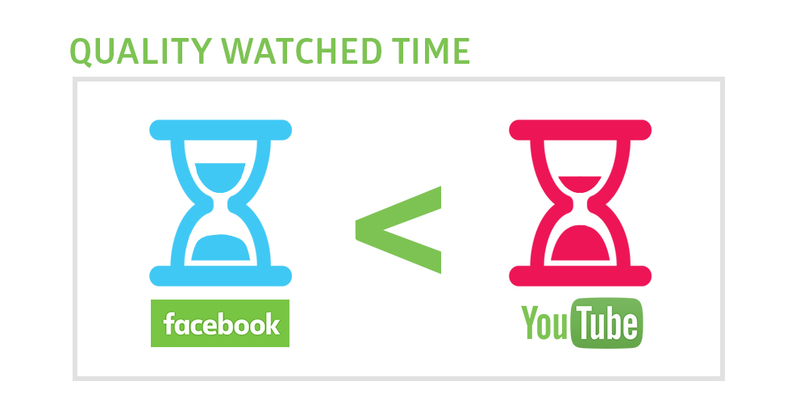 Facebook delivers more watched time than YouTube when taking into account the autoplay part of videos. YouTube Analytics only shows the watched time from the number of legitimate views for your videos. Overall watched time doesn’t affect the overall cost on either channel. This metric helps you to find out the extra time watched that you didn’t have to pay for during the campaign. Watched time could be a really impressive metric for these video giants and their epic battle, but digital advertisers and their clients should be more concerned about "quality watched time." Quality watched time is a relative metric and can vary from video to video. It’s up to you to determine what should be considered quality watched time for your video. A useful way to do this would be to count quality watched time as the point in your video where you’ve delivered your message and call-to-action (CTA). If your video is really short, maybe you’d only count complete views as quality watched time. Since our video is only 20 seconds long and the CTA is at the end of the video, we considered a complete view as quality watched time. In our experiment, Facebook video advertising delivered approximately 4.6 hours of quality watched time, at a cost of €5.47 per hour. YouTube delivered approximately 7.3 hours of quality watched time at a cost of €3.44 per hour. *Please bear in mind that these are time approximations, since YouTube also counts a view if the user is engaged (e.g. if the user clicks on the video). Moreover, a full view in Facebook is counted not only when your video is viewed to 100% of its length, but also if the user skips to this point. If you want to pay for quality watched time, YouTube may be a better advertising option than Facebook. Well, that depends on your KPIs. If you want to put your video in front of as many people as possible, you may opt for using Facebook, whereas if you want to pay for quality watched time, YouTube may be a better option. We highly recommend using both channels in order to expand your reach. Facebook beats YouTube for Impressions. 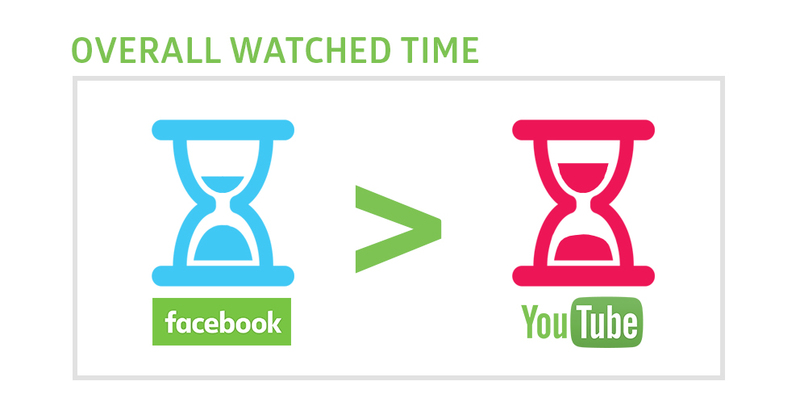 Facebook delivers more time watched than YouTube when taking into account the autoplay part of videos. Without the “unengaged” part of the view, YouTube thunders ahead on quality time watched. Set your KPIs before starting your video campaign. If you want to put your video in front of as many eyeballs as possible, you may opt for using Facebook. If you want to pay for quality watched time, YouTube is a better option. *Overall time watched is an approximation. Since there isn’t an exact way to measure watched time. The results may vary depending of the quality of your video, length and target audience. Do you use both channels? How do you measure video success? About Kenia — Kenia discovered her passion for Digital Marketing while traveling from Mexico to Argentina, where she subsidized her trip by helping boutique hotels get discovered by tourists through social media and online video. 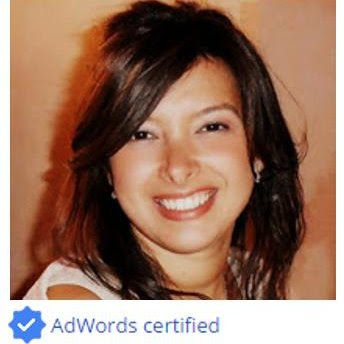 At the end of her journey in 2014, she moved to Ireland and got certified in AdWords, Analytics and Video Advertising. In 2015, Kenia joined Wolfgang Digital. Since then she has carried out integrated marketing campaigns, combining the best of paid social and paid search to get the finest of results for her clients which include Daft.ie, Sam McCauley, Career Zoo, Bord Bia and more.